The pathogenicity of the plague agent Yersinia pestis is largely due to the injection of effector proteins that potently block immune responses into host cells through a type III secretion apparatus. One Yersinia effector protein, YpkA, a putative serine/threonine kinase, has been reported to act by depolymerizing actin and disrupting actin microfilament organization. Using YpkA-GFP fusion proteins to directly visualize cells expressing YpkA, we found instead that YpkA triggered rapid cell death that can be blocked by caspase inhibitors and Bcl-xL, but was not dependent on caspase-8. The actin depolymerization promoted by YpkA was only seen in cells with other features of apoptosis, and was blocked by inhibiting apoptosis, indicating that actin filament disruption is likely to be a result, rather than a cause of YpkA-induced apoptosis. A region including aa 133–262 in YpkA was sufficient for inducing apoptosis independent of localization to the plasma membrane. These data suggest that YpkA can act as a direct inducer of cell death. The extracellular pathogens of the Yersinia species induce several diseases in humans. Infection with Yersinia pestis causes bubonic plague and pneumonic plague, and is associated with a high degree of lethality (1, 2). As such, Y. pestis is considered a class A infectious agent with potential for use as a bioterror agent (3). Two other related species, Y. pseudotuberculosis and Y. enterocolitica cause gastrointestinal infections, which can be followed by reactive arthritis (4). All three Yersinia species replicate preferentially in lymphatic tissues and induce paralysis of the host immune system (5, 6). Yersinia species possess a 70-kb plasmid that is required for pathogenicity. This plasmid encodes virulence effectors called Yersinia outer protein (Yop)3 and type III secretion system (TTSS). The TTSS functions as molecular syringe to deliver Yop to host cells via direct injection (7). Six Yops (YpkA/YopO, YopH, YopE, YopT, YopP/J, and YopM) are delivered to host cells and interfere with various host cell functions such as cytoskeletal regulation, phagocytosis, and inflammatory signaling, and also contribute to host cell death (8). Yop-induced failure to endocytose Yersinia and induction of host cell death are thought to contribute to the rapid disease onset and high lethality of Y. pestis infection. One of the Yop effectors, YpkA, has been reported to disrupt actin microfilament structures leading to morphological changes in host cells (9). YpkA is a 729 aa protein that contains an N-terminal domain (aa 1–408) including a TTSS domain at the extreme N-terminal required for delivery to host cell followed by a region homologous to eukaryotic serine/threonine kinases (see Fig. 5⇓A). The N-terminal domain of YpkA alone is sufficient to localize YpkA to the plasma membrane (10). The C-terminal domain (aa 436–729) has been reported to interact with actin, and the GTPases RhoA and Rac1 (9, 10). Interaction with actin was reported to activate YpkA kinase activity, although this was only documented in an in vitro cell extract system (9). The YpkA kinase-like domain appears to be essential for virulence of Yersinia, as Y. pseudotuberculosis harboring an internal deletion in this domain (aa 207–388) has reduced lethality in infected mice (11). However, different mutations in the kinase domain have yielded conflicting results on actin disruption (9, 10, 12) and in vivo host cell substrates for a putative YpkA kinase have not been elucidated. Thus, it is possible that YpkA may interfere with other cellular functions to enhance the pathogenicity of Yersinia. Coculture of macrophages with Yersinia results in significant cell death within 6 h (13). A recent study with a beta-lactamase reporter strain of Y. pestis showed that Yops are transduced primarily into innate immune cells within 3 days, and then these transduced cells almost completely disappeared within the following 24 h (14). These data suggest that rapid induction of cell death is a major strategy for immune suppression and dissemination of Yersinia in mammalian hosts, although the mechanisms underlying this form of death are not well characterized. YopJ, recently identified as an acetyltransferase, is thought to trigger apoptosis in infected macrophages by inhibiting NF-κB and MAPK signaling pathways (15, 16). However, reconstitution of YopJ in Y. pseudotuberculosis missing the transcriptional unit encoding YpkA and YopJ with a plasmid encoding YopJ alone does not fully restore apoptosis (13). In addition, recent studies have shown that ectopically expressed or bacterially delivered YopJ does not directly induce apoptosis without additional extracellular stimuli such as TNF or LPS (17, 18, 19). These data suggest that YopJ may not directly trigger host cell apoptosis during Yersinia infection. In this study, we show that expression of YpkA in a number of cell types directly and potently induces apoptotic cell death. These effects were not mediated by the caspase-8-dependent extrinsic apoptosis pathway used by membrane-bound death receptors in the TNF superfamily. Rather, YpkA triggered mitochondrial permeability transition and caspase-dependent apoptosis, suggesting that YpkA induces apoptosis through the mitochondrial-dependent intrinsic cell death pathway. Importantly, blocking apoptosis inhibits actin depolymerization in YpkA-expressing cells. In addition, deletion and mutagenesis studies show that neither YpkA kinase activity nor plasma membrane localization is required for apoptosis induction. These data suggest that the principal function of YpkA may be induction of cell death, and that disruption of cytoskeletal structure may be secondary to morphological changes seen in apoptotic cells. Alexa Fluor 546-phalloidin or 633-phalloidin, Hoechst 33342, and tetramethylrhodamine methyl ester, perchlorate (TMRM) were purchased from Invitrogen Life Technologies. Latrunculin B was purchased from Calbiochem. zVAD-fmk was purchased from MP Biomedicals. Recombinant human macrophage CSF was purchased from PeproTech. R-PE-conjugated rabbit anti-active caspase-3, PE-conjugated mouse IgG1, allophycocyanin-conjugated annexin V, and propidium iodide staining solution were purchased from BD Transduction Laboratories/BD Pharmingen. All YpkA fusion protein constructs were generated by PCR amplification with the plasmid pCDNA3-Flag-YpkA as a template provided by Dr. J. Dixon (University of California, San Diego, CA). PCR products were subcloned into either pEGFP-N2 or pECFP-N1 vector (BD Biosciences) using EcoRI and KpnI for cloning sites. Mutation on aspartate residue of YpkA to alanine (D267A) was made by using the QuikChange XL Site-directed Mutagenesis kit (Stratagene). YopJ and YopJ C172A were amplified by PCR using YopJ-Flag, a gift from K. Orth (University of Texas Southwestern Medical Center, Dallas, TX), as a template with 5′-EcoRI and 3′-XhoI primers and cloned into pEYFP-N1. All PCR products and the mutation site were confirmed by DNA sequencing. Bax-GFP plasmid was a gift from Dr. R. Youle (National Institute of Neurological Disorders and Stroke, National Institutes of Health, Bethesda, MD). Fas-associated death domain-containing protein (FADD)-GFP and CD8 caspase-8-GFP were previously described (20, 21). HeLa cells were cultured at 37°C in 5% CO2 in DMEM supplemented with 10% FBS, 2 mM l-glutamine, 100 U/ml penicillin, and 100 μg/ml streptomycin (complete medium). RAW 264.7, Jurkat E6.1, and Jurkat I9.2 (caspase 8-deficient) cells were cultured in complete RPMI 1640 medium. Jurkat cells that stably express Bcl-xL (22) were provided by D. Bolton (National Institute of Allergy and Infectious Diseases, National Institutes of Health, Bethesda, MD) and maintained with 400 μg/ml G418 in complete RPMI 1640 medium. Human monocyte-derived macrophages (MDM) were generated from elutriated monocytes obtained from healthy adult donors at the National Institutes of Health Clinical Center blood bank. After the monocytes were adhered to petri dishes in RPMI 1640 medium for 90 min at 37°C in 5% CO2, the cells were washed with PBS twice followed by differentiation in vitro for 7 days in RPMI 1640 medium supplemented with 10% FBS, 12.5 μg/ml macrophage CSF, 2 mM l-glutamine, 100 U/ml penicillin, and 100 μg/ml streptomycin. HeLa and RAW 264.7 cells were transiently transfected with plasmids using FuGENE6 transfection reagent (Roche Diagnostics) or T cell Nucleofector kit (Amaxa Biosystems) according to the manufacturer’s instructions. Human MDM were transfected with 5 μg of plasmid using Human Macrophage Nucleofector kit (Amaxa Biosystems) according to the manufacturer’s instructions. Jurkat cells were transfected with 20 μg of plasmid by electroporation (BTX) using 260 V, 725 Ohm, and 1025 F.
For immunofluorescence microscopy, HeLa and RAW 264.7 cells were cultured on cover slips for 24 h after transfection. Jurkat cells were adhered to slides coated with poly-l-lysine (Sigma-Aldrich) at 24 h after transfection. Cells were fixed in 4% paraformaldehyde (Sigma-Aldrich) for 15 min at room temperature, washed with PBS, and permeabilized with PBS containing 0.04% saponin (solution A) for 15 min at room temperature. After blocking with 1% BSA in solution A for 45 min, cells were stained with the Alexa Fluor 546-phalloidin for 2 h. Cells were washed with solution A and stained with Hoechst 33342 (20 μg/ml) for 5 min, followed by mounting on glass slides in VECTASHIELD mounting medium (Vector Laboratories). Images were collected on a Zeiss LSM 510 confocal microscope using ×40 or ×63 1.4 NA objective lens. The images presented were representatives of at least three independent experiments. To measure apoptosis, cells were washed once in PBS and resuspended in buffer containing 10 mM HEPES, 150 mM NaCl, 2 mM CaCl2, 1 mM MgCl2 with annexin V-allophycocyanin (4 μl/0.5 × 106 cells) or TMRM at a final concentration of 200 nM. After 15 min at 37°C, propidium iodide was added to the cells at 1 μg/ml. Alternatively, cells were fixed in 4% paraformaldehyde for 15 min at room temperature, permeabilized in 90% methanol for 30 min on ice, and stained with anti-active caspase-3 Ab conjugated with PE (4 μl/0.5 × 106 cells) in PBS containing 1% BSA for 30 min on ice. For quantification of F-actin levels, transfected cells were washed once in PBS, fixed in PBS containing 1% paraformaldehyde, 0.1% Triton X-100, and 5 mM EDTA for 15 min at room temperature, washed twice in PBS with 2 mM EDTA, and then stained with Alexa Fluor 633-phalloidin (4 μl/0.5 × 106 cells) in PBS with 0.1% Triton X-100 for 30 min on ice. Samples were analyzed on a FACSCalibur flow cytometer (BD Biosciences), and data acquisition was performed using CellQuest software. For the analysis of yellow fluorescent protein (YFP)- and cyan fluorescent protein (CFP)-expressing cells, a CyAn flow cytometer (DakoCytomation) was used. The live CFP/YFP double-positive population was gated, and annexin V-allophycocyanin level was examined in this population. The same CFP/YFP gates were used in all samples within an experiment. To visualize the effects of YpkA on cells, we constructed a vector that expressed YpkA fused to GFP at the C terminus, designated pYpkA-GFP. When HeLa cells were transfected with pYpkA-GFP and stained with phalloidin, we observed morphological changes as reported by others (9, 10). However, in the same cells that showed disruption of F-actin stress fibers, we found changes consistent with apoptosis such as nuclear condensation, cell shrinkage, and membrane blebbing were also apparent (Fig. 1⇓A and data not shown). The adherent macrophage cell line RAW 264.7 also showed the morphological changes of apoptosis (Fig. 1⇓B). Cell death in these adherent cell lines may have been the result of cell detachment, a process termed anoikis (23, 24). We therefore expressed YpkA-GFP in a nonadherent T cell line, Jurkat. However, we observed even more pronounced apoptotic changes in Jurkat cells expressing YpkA (Fig. 1⇓B). Thus YpkA expression induces cell death independently of effects on cell adherence. YpkA promotes apoptosis in epithelial and immune cells. A, HeLa cells were transfected with plasmids encoding GFP or YpkA fused to GFP (YpkA-GFP). Twenty-four hours after transfection, cells were stained with Alexa Fluor 546-phallodin and Hoechst dye and examined using confocal microscopy. B, RAW 264.7 (top) and Jurkat (bottom) cells were transfected with pYpkA-GFP and subjected to the same staining and examination as in A. C–F, The indicated cell types were transfected with either GFP control plasmid or pYpkA-GFP. Twenty-four hours later, cells were stained with anti-active caspase-3 PE (C–E) or annexin V-allophycocyanin (F) and assessed by flow cytometry. Percentage shown represents caspase-3-positive or annexin V-positive cells among the gated GFP-positive cells. We next determined whether the morphological changes observed were associated with caspase activation that occurs in classical apoptosis. Caspase-3 activation can be measured on a single-cell basis by intracellular staining using a mAb that specifically recognizes active caspase-3. In all three cell lines, YpkA-expressing cells contained more active caspase-3 than control GFP-expressing cells (Fig. 1⇑, C–E), even those cells expressing lower levels of YpkA-activated caspase-3 with high frequency. YpkA-expressing Jurkat T cells also showed increased binding of annexin V, an early apoptotic marker (Fig. 1⇑F). Transfection of a construct encoding YpkA fused to GFP at the N terminus or cotransfection of plasmids encoding YpkA and GFP produced similar results (data not shown), indicating that apoptosis induction was independent of a particular conformation or sequence in the fusion protein. Because YpkA has been reported to localize to the plasma membrane (25), we considered the possibility that YpkA might activate the extrinsic pathway of apoptosis triggered by cell surface receptors such as Fas and TRAIL (26). In Jurkat cells, caspase-8 is required for receptor-mediated apoptosis triggered by Fas ligand and TRAIL (27, 28). We therefore expressed YpkA in mutant Jurkat cells (Jurkat I9.2) that are deficient in caspase-8 and resistant to Fas ligand- and TRAIL-mediated apoptosis (27). 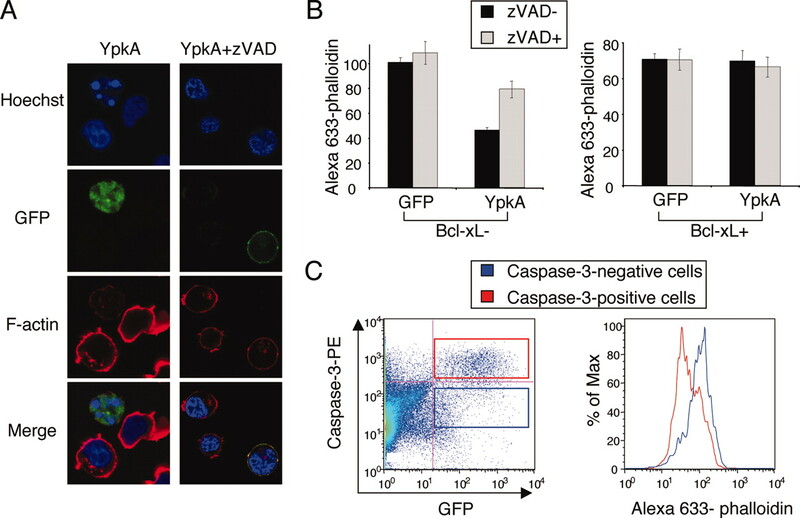 Caspase-8-deficient cells displayed similar sensitivity to YpkA-induced apoptosis as did wild-type Jurkat cells when measured by active caspase-3 staining and annexin V exposure, even though the generalized caspase inhibitor zVAD-fmk blocked apoptosis (Fig. 2⇓A and data not shown). YpkA triggers apoptosis through the intrinsic pathway. A, Caspase-8-deficient Jurkat I9.2 cells were transfected with plasmid encoding GFP or YpkA-GFP and incubated for 24 h with or without zVAD. The cells were stained with anti-active caspase-3 PE and assessed by flow cytometry. The percentage shown represents caspase-3-positive cells among GFP-positive cells. B, Jurkat cells expressing either the neomycin resistance gene (Bcl-xL-negative; ▪) or Bcl-xL (Bcl-xL-positive; ▦) were transfected with plasmids encoding GFP or YpkA-GFP. After 24 h, the cells were analyzed by staining with anti-active caspase-3 PE, annexin V-allophycocyanin, or TMRM using flow cytometry. Data represents the percentage of caspase-3-positive, annexin V-positive, or TMRM-negative cells among GFP-positive cells. C–E, Jurkat cells were transfected with plasmid encoding GFP, YpkA-GFP, FADD-GFP, Bax-GFP, or CD8 caspase-8-GFP and incubated for 24 h with or without zVAD. The cells were stained with anti-active caspase-3 PE, annexin V-allophycocyanin, or TMRM and analyzed by flow cytometry. Data represent the percentage of caspase-3-positive, annexin V-positive or TMRM-negative cells among GFP-positive cells. Bcl-2 family of antiapoptotic proteins such as Bcl-2 and Bcl-xL are localized on the outer mitochondrial and other intracellular membranes, and when overexpressed protect cells from a wide variety of apoptotic stimuli (29). As seen in Fig. 2⇑B, caspase-3 activation and annexin V staining in YpkA-expressing cells were almost completely prevented in Jurkat cells stably expressing Bcl-xL. Importantly, when mitochondrial membrane potential was measured more directly with the potentiometric mitochondrial dye TMRM, Bcl-xL expression still potently protected cells from mitochondrial depolarization induced by YpkA. To determine whether the apoptosis induced by YpkA is dependent on caspase activation, we expressed YpkA in Jurkat cells in the presence of the broad-spectrum cell-permeable caspase inhibitor zVAD-fmk. 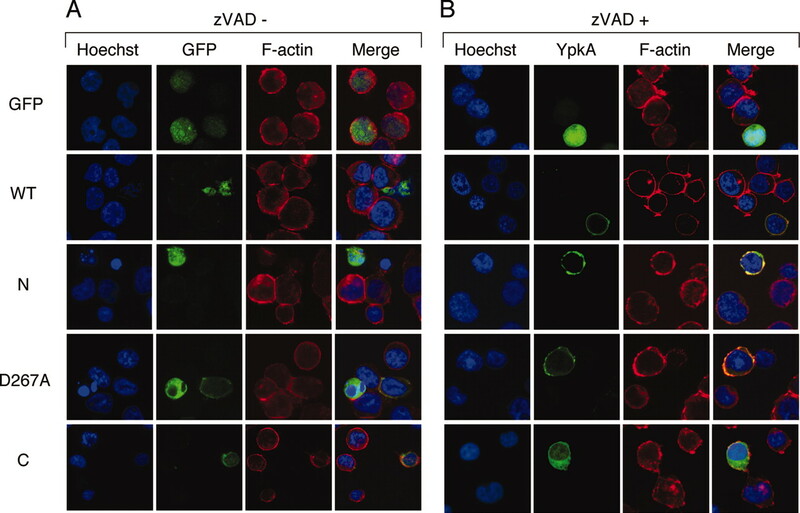 Treatment with zVAD completely protected these cells from YpkA-induced apoptosis when measured by active caspase-3 staining and annexin V binding (Fig. 2⇑, C and D). However, zVAD could not block the loss of mitochondrial membrane potential induced by YpkA (Fig. 2⇑E). This pattern was similar to other death-inducing molecules that act upstream of caspase activation such as FADD and Bax, although mitochondrial depolarization induced by a plasmid encoding a constitutively active CD8 caspase-8 fusion protein (20) was partially blocked by zVAD treatment (Fig. 2⇑E). This result suggests that the cell death triggered by YpkA may induce mitochondrial depolarization before global caspase activation. Cell death triggered by YpkA in caspase-8-deficient cells also remained caspase-dependent (Fig. 2⇑A), unlike other apoptotic stimuli such as TNF, which induces caspase-independent death in the absence of caspase-8 (30). Taken together, these data strongly argue that YpkA triggers cell death by directly activating the intrinsic apoptotic pathway, with mitochondrial depolarization as an early manifestation of YpkA action. To confirm that the morphological features of apoptosis induced by YpkA depend on caspase activity, we examined Jurkat I9.2 cells after transfection with pYpkA-GFP in the presence or absence of zVAD by confocal microscopy for GFP, F-actin, and nuclear morphology. As can be seen in Fig. 3⇓A, in accordance with the flow cytometric assessment of apoptosis, zVAD treatment largely reversed the nuclear condensation and fragmentation in the YpkA-expressing control cells. 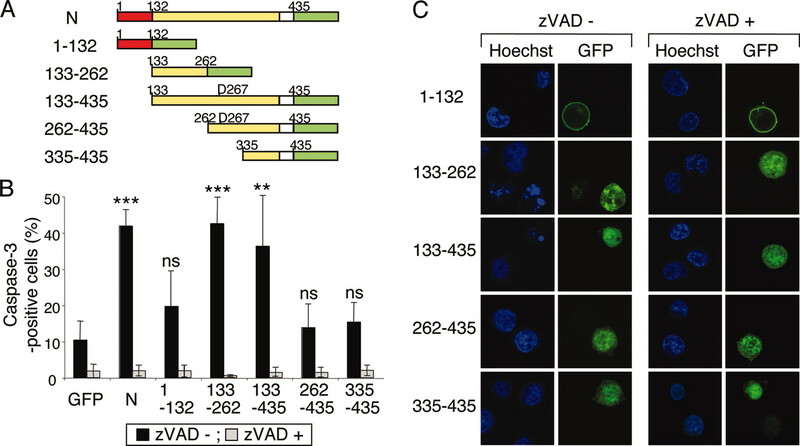 Interestingly, both the plasma membrane localization of YpkA and actin cortical ring structures are restored in the transfectants treated with zVAD (Fig. 3⇓A, right column). This suggests that localization of YpkA to the plasma membrane may be disrupted by caspase activation during apoptosis and the actin depolymerization observed in apoptotic YpkA-expressing cells may be a secondary effect to apoptosis. Dual staining with mitochondrial probes showed that YpkA is not localized in the mitochondria when expressed with or without caspase inhibition (data not shown). Actin disruption in YpkA-expressing cells is secondary to cell death. A, Jurkat I9.2 cells were transfected with plasmid encoding YpkA-GFP, and incubated for 24 h with or without zVAD. The cells were stained with Alexa Fluor 546-phalloidin and Hoechst dye and then imaged using confocal microscopy. B, Jurkat cells (left) or Jurkat/Bcl-xL cells (right) were transfected with plasmids encoding GFP or YpkA-GFP and incubated for 24 h with zVAD (▦) or without (▪). The cells were stained with Alexa Fluor 633-phalloidin and anti-active caspase-3 PE. Data are the geometrical mean intensity of Alexa Fluor 633-phalloidin staining cells among GFP-positive cells. C, YpkA-expressing Jurkat cells were gated on caspase-3-positive (red) and caspase-3-negative (blue) populations (left). The histogram of Alexa Fluor 633-phalloidin staining of each population is illustrated (right) for caspase-3-positive (red) and caspase-3-negative (blue) populations. During apoptosis, caspases can cleave actin and other proteins that control actin polymerization (31). Conversely, disruption of the actin cytoskeleton can induce apoptosis via activation of death receptors and other mechanisms (32, 33, 34). To determine which is the primary event in a large population of cells, we quantitated F-actin levels in YpkA-expressing cells with and without caspase inhibition using phalloidin staining in a two-color flow cytometric assay. As shown in Fig. 3⇑B, YpkA-expressing cells had ∼50% decreased F-actin content compared with GFP-expressing cells. However, this reduction was significantly reversed by the treatment of zVAD. In Bcl-xL-expressing Jurkat cells, actin depolymerization induced by YpkA was completely abrogated (Fig. 3⇑B, right). Additionally, simultaneous measurement of active caspase-3 and F-actin levels in YpkA-transfected cells without caspase inhibitors revealed that the caspase-3-positive population had significantly lower F-actin levels than the caspase-3-negative population in cells from the same transfection (Fig. 3⇑C). These results strongly suggest that the actin depolymerization seen in YpkA-transfected cells is dependent on apoptosis triggered by YpkA, and not a direct effect of YpkA itself. Microscopic examination of zVAD-treated or Bcl-xL-expressing Jurkat cells that are resistant to the apoptotic effects by YpkA revealed complete protection from YpkA-induced actin depolymerization, with normal appearing of actin cortical rings (Figs. 3⇑A, right column, and 4⇓, left column). This observation is in contrast to the reduced or disrupted actin filaments seen when YpkA-induced apoptosis was allowed to occur (Figs. 1⇑, A and B, and 3⇑A, left column). 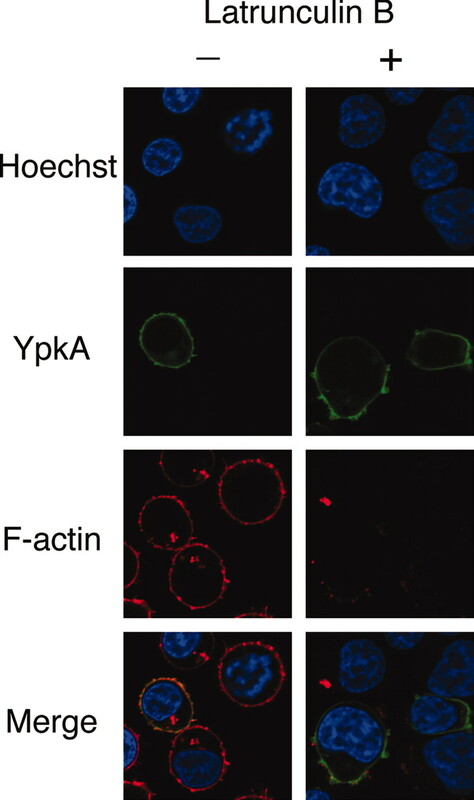 YpkA localizes to the plasma membranes independently of F-actin. Twenty-four hours after transfection of Jurkat cells expressing Bcl-xL (Jurkat/Bcl-xL) with pYpkA-GFP, the cells were treated with latrunculin B (2 μM) for 10 min to disrupt actin filaments and inhibit actin polymerization. Then cells were stained with Alexa 546-phalloidin and Hoechst dye, and imaged using confocal microscopy. Because YpkA was reported to have an actin-dependent kinase activity and to interact with actin in vitro (9), we asked whether interaction with cortical F-actin is necessary for YpkA to localize to the plasma membrane. We treated YpkA-expressing cells with latrunculin B, a potent inhibitor of actin polymerization that disrupts microfilament organization (35). Bcl-xL-expressing Jurkat cells were used to mitigate the effects on apoptosis and allow for efficient membrane localization of YpkA. Treatment with latrunculin B for 10 min almost completely disrupted F-actin cortical microfilaments, yet YpkA still localized to the plasma membrane even in cells (Fig. 4⇑). This result indicates that the localization of YpkA to the plasma membrane is not dependent on the integrity of the cortical F-actin ring. The N-terminal domain of YpkA containing the TTSS and the kinase domain has been reported to be responsible for plasma membrane localization (10), but whether this domain mediates apoptosis was not known. To examine this role, we constructed YpkA mutants expressing the N-terminal domain (aa 1–435, YpkA-N) or the C-terminal domain (aa 433–729, YpkA-C) or a mutant with an inactivating mutation in the catalytic site of YpkA (D267A) as shown in Fig. 5⇓A. Both the YpkA-N and YpkA (D267A) mutants induced caspase-3 activation and annexin V staining to the same level as full-length YpkA in Jurkat cells, and apoptotic changes were abrogated by treatment with zVAD (Fig. 5⇓B). In contrast, the C-terminal domain of YpkA triggered much weaker apoptosis, as shown by lower levels of caspase-3 activation and no significant difference in annexin V or TMRM staining from the background of GFP-expressing cells. Importantly, the YpkA N-terminal domain and the D267A kinase mutant, but not the YpkA C-terminal domain, induced apoptosis in primary human MDM (Fig. 5⇓C). Unlike the other cell types, zVAD treatment in MDM enhanced cell death (data not shown), which is consistent with other reports that cell death in primary macrophages has prominent caspase-independent components (36, 37). The YpkA N-terminal region but not kinase catalytic activity is critical for apoptosis induction. A, Schematic diagram of wild-type and mutant versions of YpkA. B, Jurkat cells were transfected with plasmids encoding wild-type or mutant YpkA-GFP or GFP. After treatment with zVAD (▦) for 24 h or without zVAD (▪), the cells were stained with anti-active caspase-3 PE (left) or annexin V-allophycocyanin (right) and analyzed by flow cytometry. C, Human MDM were transfected with the plasmids encoding wild-type or mutant YpkA-GFP or GFP. After 48 h, the cells were stained with annexin V-allophycocyanin (left) or TMRM (right) followed by flow cytometric analysis. Data represent the percentage of caspase-3-positive, annexin V-positive, or TMRM-negative cells among GFP-positive cells. ∗∗∗, p < 0.001; ∗∗, 0.001 < p < 0.01; ∗, 0.01 < p < 0.05; ns, p > 0.05 between GFP and YpkA variants using unpaired t test analysis. Examination of Jurkat cells transfected with these mutants by confocal microscopy revealed that both YpkA-N and YpkA (D267A) mutants induced nuclear apoptotic changes and actin filament disruption that were reversed with zVAD treatment. In nonapoptotic cells, both mutants also localized to the plasma membrane (Fig. 6⇓). However, YpkA-C mutant was expressed mainly in the cytoplasm rather than in the membrane and the nucleus, and did not induce apoptotic nuclear changes or disrupt actin filaments (Fig. 6⇓, A and B, bottom). In HeLa cells, cell shrinkage and membrane blebbing could be seen in YpkA- and YpkA-N-transfected cells before depolymerization of actin filaments, suggesting that in these cells also, actin depolymerization is a late manifestation of apoptosis induced by YpkA (data not shown). Thus the N-terminal domain but not kinase activity itself is sufficient to induce apoptosis independently of effects on actin. The YpkA N terminus but not catalytic activity is critical for induction of apoptotic cell morphology and plasma membrane localization. Jurkat cells were transfected with plasmids encoding wild-type or mutant versions of YpkA-GFP or GFP alone. After treatment with zVAD for 24 h (B) or without treatment (A), cells were stained with Alexa Fluor 546-phalloidin and Hoechst dye and imaged using confocal microscopy. To define the minimal region within the N-terminal domain that is necessary for YpkA-mediated apoptosis, we created a series of deletion mutants in YpkA N-terminal domain as shown in Fig. 7⇓A. 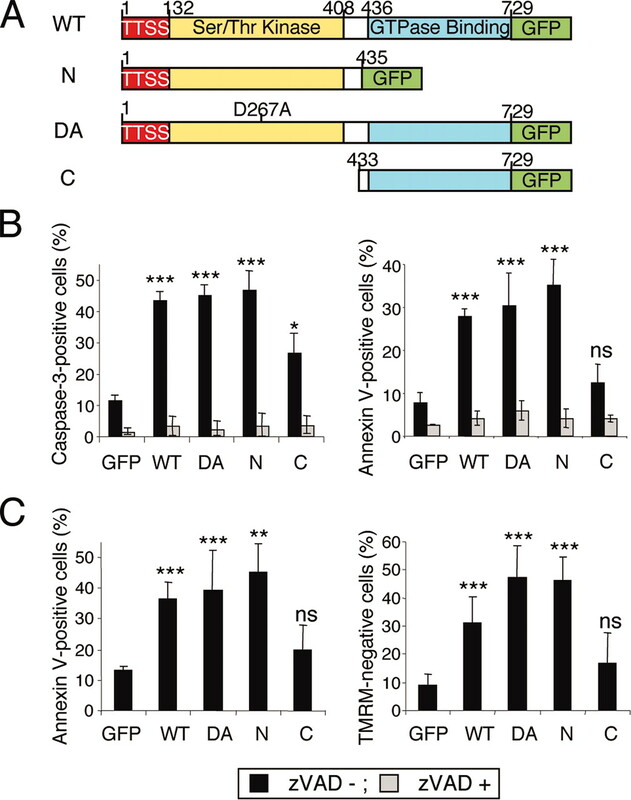 Mutants encoding YpkA (aa 133–262) and YpkA (aa 133–435) induced caspase-dependent apoptosis as potently as the entire N-terminal domain of YpkA (YpkA-N) by measurement of caspase-3 activation and nuclear morphological changes (Fig. 7⇓, B and C). However, YpkA (aa 262–435) that includes the catalytic core of the putative serine/threonine kinase or YpkA (aa 1–132) encoding the bacterial TTSS targeting sequences, did not induce apoptosis above background levels, indicating that neither the kinase-like catalytic core nor the TTSS domain is required for apoptosis induction. Interestingly confocal microscopic examination of cells transfected with these mutants demonstrated that the apoptosis-inducing YpkA (aa 133–262) and YpkA (aa 133–435) fragments failed to localize to the plasma membrane, localizing instead to the nucleus and diffusely in the cytoplasm, as seen most clearly in zVAD-treated cells (Fig. 7⇓C, right panels). Only the N-terminal region of YpkA (aa 1–132) containing the bacterial TTSS targeting sequences localized to the plasma membrane (Fig. 7⇓C), but did not induce apoptosis. These results establish that aa 133–262 of YpkA contain the minimal sequences sufficient for apoptosis induction and indicate that apoptosis induction can be separated from the plasma membrane localization of this bacterial effector protein that is determined by sequences within the N-terminal aa 132. In addition, the fact that a region of YpkA lacking the putative kinase catalytic core can induce apoptosis confirms the results with the mutant D267A, indicating that kinase activity is not required for apoptosis induction by YpkA. Defining a minimal region of YpkA responsible for apoptosis induction. A, Schematic of mutant versions of YpkA. B, Jurkat cells were transfected with plasmids encoding GFP, and the indicated YpkA-GFP truncation plasmids. After treatment with zVAD for 24 h (▦) or without treatment (▪), the cells were stained with anti-active caspase-3 PE and analyzed by flow cytometry. Data are the percentage of caspase-3-positive cells among GFP-positive cells. ∗∗∗, p < 0.001; ∗∗, 0.001 < p < 0.01; ∗, 0.01 < p < 0.05; ns, p > 0.05 between GFP and YpkA variants using unpaired t test analysis. C, Cells transfected with the indicated YpkA-GFP truncation constructs were stained with Hoechst dye and imaged using confocal microscopy. Although YopJ has been implicated in apoptosis induction during Yersinia infection of macrophages (13), more recent reports indicated that YopJ does not trigger apoptosis directly but rather sensitizes cells to die upon triggering receptors such as TLR4 and TNFR1 by blocking NF-κB and MAPK signaling that promote host cell survival pathways (15, 17, 18, 19). Recently, YopJ was found to act as an acetyltransferase that modified critical serine and threonine residues in MAPK kinases that blocked kinase activity. A mutation in the putative catalytic core of YopJ (C176A) was unable to acetylate MAPK kinase or block signal transduction. To investigate possible synergy between YpkA- and YopJ-induced apoptosis, we coexpressed YpkA and YopJ fused to spectrally distinct GFP variants so that double-expressing cells could be specifically identified and analyzed for apoptosis by flow cytometry. As shown in Fig. 8⇓, YpkA induced apoptosis in ∼40% of the transfected cells, whereas wild-type YopJ or mutant YopJ (C176A) was not able to induce apoptosis, which is consistent with a previous report (17). Importantly, we did not observe increased apoptosis in cells expressing both YpkA and either wild-type or mutant YopJ (Fig. 8⇓). No increase suggests that there is no synergistic effect on apoptosis between these two Yersinia effector proteins. Induction of apoptosis by YpkA and YopJ. HeLa cells were transfected with plasmids expressing the indicated proteins. After 20 h, the cells were stained with annexin V-allophycocyanin followed with flow cytometric analysis. YpkA was fused to CFP and both wild-type and mutant (C172A) YopJ were fused to YFP. Values shown represent the percentage of annexin V-positive cells among CFP/YFP double-positive cells. Data are representative of three independent experiments. Paralysis of the host immune system by Yersinia involves suppression of phagocytosis, cytokine production, and induction of cell death (8, 38, 39). In this study, we show that YpkA directly induces apoptosis in immune and epithelial cells, including primary human MDM, and we define the region of YpkA responsible for this effect. The intracellular level of YpkA delivered by Yersinia TTSS may be lower compared with YpkA expressed via transfection, but the proapoptotic effect of YpkA was clearly observed at very low levels of expression of the fusion protein in multiple cell types, as seen in Fig. 1⇑, C–F. Although YpkA has previously been shown to disrupt actin microfilament organization in HeLa cells (9, 10), our results show that induction of cell death is the primary event induced by YpkA expression in mammalian cells. Actin depolymerization appears to be a consequence rather than a cause of apoptosis in YpkA-expressing cells because it could only be seen in cells already apoptotic by other criteria, and inhibition of apoptosis completely prevented actin depolymerization in YpkA-expressing cells. Previous observations of changes in cellular morphology and stress fiber disruption in HeLa cells might have been secondary to YpkA-induced apoptosis, particularly because actin is a substrate for caspases and actin disruption often accompanies apoptosis (31). Although Jurkat cells have an F-actin cortical ring structure, not microfilaments as in HeLa cells, YpkA expression decreased the F-actin level ∼50% in both cell lines, indicating that the actin disruption by YpkA is not cell-type specific (Fig. 3⇑B and data not shown). The minimal region of YpkA that induces apoptosis lacks the catalytic domain of the putative serine/threonine kinase of YpkA and does not localize to the plasma membrane, suggesting that neither of these functions is necessary for YpkA-induced cell death. Although YpkA has been reported to be an actin-dependent kinase in vitro, our results showed YpkA localized to the plasma membrane independently of F-actin, and the kinase domain is not necessary for apoptosis induction. Additionally, in contrast to studies in which the C-terminal domain of YpkA encoding a putative GTPase-binding motif might be critical for actin filament disruption (9, 10), we observed that the C-terminal domain of YpkA was unable to cause either apoptosis or actin disruption. This is more consistent with a report that the N-terminal domain of YpkA still functions to decrease the cell viability in yeast (12). Håkansson et al. (25) have reported that YpkA translocated from Yersinia localizes to the inner surface of the target-cell plasma membrane, similar to what we observed in transfections with YpkA-GFP fusion proteins. Furthermore, we found that the TTSS recognition region aa 1–132 is responsible for YpkA to localize into the plasma membrane, but no known plasma membrane targeting sequences that direct palmitoylation, myristoylation, prenylation sites, or glycosyl phosphatidylinositol linkages could be identified within this region (40, 41, 42, 43). YpkA may thus be targeted to the plasma membrane through a distinct sequence or interaction with other proteins proximal to the plasma membrane. The multiple functions we have found in the N-terminal domain of YpkA would not be unprecedented, as the N-terminal domain of another Yersinia effector protein, YopH, was demonstrated to have multiple functions such as interaction with bacterial chaperones leading to secretion/translocation, localization to focal adhesions in host cells, and recognition of substrates including p130Cas and paxillin in a phosphotyrosine-dependent manner (44, 45). Despite its plasma membrane localization, our data suggest that YpkA directly induces apoptosis without the involvement of death receptors or death receptor signaling components such as caspase-8, because caspase-8 deficiency did not alter YpkA-induced cell death. Instead given the cytoplasmic localization of YpkA in apoptotic cells as well as the constitutive cytoplasmic localization of the apoptosis-inducing YpkA (aa 133–262) and YpkA (aa 133–435) fragments, YpkA-mediated apoptosis is likely to be triggered by activation of cytoplasmic components of the apoptotic machinery. The fact that caspase inhibitors and Bcl-xL overexpression largely rescued YpkA-expressing cells from cell death implicates activation of caspases and mitochondrial outer membrane permeabilization as critical elements for YpkA-induced apoptosis. As neither wild-type nor any of the tested YpkA mutants localized to mitochondria irrespective of caspase activation, YpkA may induce mitochondrial depolarization through other as yet unidentified interacting proteins. The significant loss of mitochondrial membrane potential in YpkA-expressing cells even in the presence of caspase inhibitors implies a direct activation of the mitochondrial permeability transition pathway without any intervening upstream caspases, and is similar to the apoptosis generated by FADD and the proapoptotic Bcl-2 family member Bax in this system (Fig. 2⇑E). A similar pathway of apoptosis has also been reported with the HIV-1 viral protein R Vpr that showed a direct effect on the mitochondrial permeability transition pore complex: Bcl-2 prevented but zVAD failed to prevent the mitochondrial dysfunction, although both did reduce the DNA loss and annexin V staining (46). Genetic studies have previously implicated YopJ as a factor in induction of apoptosis in macrophages cocultured with Yersinia (13, 47). However, reintroduction of YopJ alone did not fully restore apoptosis in HeLa cells infected with mutant Y. pseudotuberculosis lacking both ypka and yopj (13, 48). In addition, recent reports have shown the primary function of YopJ is to interfere with cellular survival by modification of the MAPK and NF-κB pathways (16, 49), and extrinsic signals such as LPS or TNF are required for YopJ-dependent cell death (19, 50). We confirmed the lack of spontaneous apoptosis induced by YopJ transfection, and showed that YopJ does not increase YpkA-induced cell death (Fig. 8⇑). Unlike YopJ, YpkA does not modify MAPK or NF-κB activities (data not shown). However YpkA contributes to the virulence of Yersinia infection in animal models independently of YopJ (11). In a rat model of bubonic plague, YopJ-deficient Yersinia infection was not attenuated in lethality despite lower rates of apoptosis induction in lymph nodes (51). Our data suggest that during Yersinia infection, YopJ may induce apoptosis in cells that are stimulated by bacterial components, whereas YpkA may induce apoptosis directly. Because macrophages are the main target during Yersinia infection (14), YpkA-mediated apoptosis in human MDM may be directly relevant to the pathogenesis of plague. In addition, YopH was recently implicated in direct induction of cell death (52). Therefore the action of multiple Yops may allow the remarkably efficient and rapid induction of cell death of Yop-transduced cells during infection with Y. pestis and this response may contribute to the fulminant clinical course of bubonic and pneumonic plague (14). We thank the National Institute of Arthritis and Musculoskeletal and Skin Diseases Imaging and Flow Cytometry core facilities for their skillful assistance; Kim Orth (University of Texas Southwestern) and Diane Bolton (National Institute of Allergy and Infectious Diseases, National Institutes of Health) for reagents and Juan Rivera, Meg Roberts, Steve Brooks, and Rebecca Belzer of the National Institute of Arthritis and Musculoskeletal and Skin Diseases Biodefense Group for vector construction and suggestions. We also thank James Bliska (State University of New York, Stony Brook) for helpful discussions. ↵1 This work was supported by the Intramural Research Program of the National Institute of Arthritis and Musculoskeletal and Skin Diseases, National Institutes of Health, and by a National Institutes of Health-Food and Drug Administration trans-institute Intramural Biodefense grant from the National Institute of Allergy and Infectious Diseases. ↵3 Abbreviations used in this paper: YOP, Yersinia outer protein; MDM, monocyte-derived macrophage; TTSS, type III secretion system; TMRM, tetramethylrhodamine methyl; FADD, Fas-associated death domain; YFP, yellow fluorescent protein; CFP, cyan fluorescent protein. Carniel, E.. 2002. The plague. C. R. Biol. 325: 851-853. White, M. E., D. Gordon, J. D. Poland, A. M. Barnes. 1980. Recommendations for the control of Yersinia pestis infections: recommendations from the CDC. Infect. Control 1: 324-329. Lazarus, A. A., C. F. Decker. 2004. Plague. Respir. Care Clin. N. Am. 10: 83-98. Braun, J., J. Sieper. 1999. Rheumatologic manifestations of gastrointestinal disorders. Curr. Opin. Rheumatol. 11: 68-74. Anderson, G. W., Jr, S. E. Leary, E. D. Williamson, R. W. Titball, S. L. Welkos, P. L. Worsham, A. M. Friedlander. 1996. Recombinant V antigen protects mice against pneumonic and bubonic plague caused by F1-capsule-positive and -negative strains of Yersinia pestis. Infect. Immun. 64: 4580-4585. Une, T., R. R. Brubaker. 1984. Roles of V antigen in promoting virulence and immunity in yersiniae. J. Immunol. 133: 2226-2230. Hueck, C. J.. 1998. Type III protein secretion systems in bacterial pathogens of animals and plants. Microbiol. Mol. Biol. Rev. 62: 379-433. Navarro, L., N. M. Alto, J. E. Dixon. 2005. Functions of the Yersinia effector proteins in inhibiting host immune responses. Curr. Opin. Microbiol. 8: 21-27. Juris, S. J., A. E. Rudolph, D. Huddler, K. Orth, J. E. Dixon. 2000. A distinctive role for the Yersinia protein kinase: actin binding, kinase activation, and cytoskeleton disruption. Proc. Natl. Acad. Sci. USA 97: 9431-9436. Dukuzumuremyi, J. M., R. Rosqvist, B. Hallberg, B. Akerstrom, H. Wolf-Watz, K. Schesser. 2000. The Yersinia protein kinase A is a host factor inducible RhoA/Rac-binding virulence factor. J. Biol. Chem. 275: 35281-35290. Galyov, E. E., S. Håkansson, A. Forsberg, H. Wolf-Watz. 1993. A secreted protein kinase of Yersinia pseudotuberculosis is an indispensable virulence determinant. Nature 361: 730-732. Nejedlik, L., T. Pierfelice, J. R. Geiser. 2004. Actin distribution is disrupted upon expression of Yersinia YopO/YpkA in yeast. Yeast 21: 759-768. Marketon, M. M., R. W. DePaolo, K. L. DeBord, B. Jabri, O. Schneewind. 2005. Plague bacteria target immune cells during infection. Science 309: 1739-1741. Mukherjee, S., G. Keitany, Y. Li, Y. Wang, H. L. Ball, E. J. Goldsmith, K. Orth. 2006. Yersinia YopJ acetylates and inhibits kinase activation by blocking phosphorylation. Science 312: 1211-1214. Trosky, J. E., S. Mukherjee, D. L. Burdette, M. Roberts, L. McCarter, R. M. Siegel, K. Orth. 2004. Inhibition of MAPK signaling pathways by VopA from Vibrio parahaemolyticus. J. Biol. Chem. 279: 51953-51957. Martin, D. A., R. M. Siegel, L. Zheng, M. J. Lenardo. 1998. Membrane oligomerization and cleavage activates the caspase-8 (FLICE/MACHα1) death signal. J. Biol. Chem. 273: 4345-4349. Siegel, R. M., D. A. Martin, L. Zheng, S. Y. Ng, J. Bertin, J. Cohen, M. J. Lenardo. 1998. Death-effector filaments: novel cytoplasmic structures that recruit caspases and trigger apoptosis. J. Cell Biol. 141: 1243-1253. Bolton, D. L., B. I. Hahn, E. A. Park, L. L. Lehnhoff, F. Hornung, M. J. Lenardo. 2002. Death of CD4+ T-cell lines caused by human immunodeficiency virus type 1 does not depend on caspases or apoptosis. J. Virol. 76: 5094-5107. Grossmann, J., K. Walther, M. Artinger, S. Kiessling, J. Scholmerich. 2001. Apoptotic signaling during initiation of detachment-induced apoptosis (“anoikis”) of primary human intestinal epithelial cells. Cell Growth Differ. 12: 147-155. Rytomaa, M., L. M. Martins, J. Downward. 1999. Involvement of FADD and caspase-8 signalling in detachment-induced apoptosis. Curr. Biol. 9: 1043-1046. Håkansson, S., E. E. Galyov, R. Rosqvist, H. Wolf-Watz. 1996. The Yersinia YpkA Ser/Thr kinase is translocated and subsequently targeted to the inner surface of the HeLa cell plasma membrane. Mol. Microbiol. 20: 593-603. Juo, P., C. J. Kuo, J. Yuan, J. Blenis. 1998. Essential requirement for caspase-8/FLICE in the initiation of the Fas-induced apoptotic cascade. Curr. Biol. 8: 1001-1008. Sprick, M. R., M. A. Weigand, E. Rieser, C. T. Rauch, P. Juo, J. Blenis, P. H. Krammer, H. Walczak. 2000. FADD/MORT1 and caspase-8 are recruited to TRAIL receptors 1 and 2 and are essential for apoptosis mediated by TRAIL receptor 2. Immunity 12: 599-609. Chan, F. K., M. J. Lenardo. 2000. A crucial role for p80 TNF-R2 in amplifying p60 TNF-R1 apoptosis signals in T lymphocytes. Eur. J. Immunol. 30: 652-660. Mashima, T., M. Naito, T. Tsuruo. 1999. Caspase-mediated cleavage of cytoskeletal actin plays a positive role in the process of morphological apoptosis. Oncogene 18: 2423-2430. Gajate, C., F. Mollinedo. 2005. Cytoskeleton-mediated death receptor and ligand concentration in lipid rafts forms apoptosis-promoting clusters in cancer chemotherapy. J. Biol. Chem. 280: 11641-11647. DeMeester, S. L., J. P. Cobb, R. S. Hotchkiss, D. F. Osborne, I. E. Karl, K. W. Tinsley, T. G. Buchman. 1998. Stress-induced fractal rearrangement of the endothelial cell cytoskeleton causes apoptosis. Surgery 124: 362-371. Suria, H., L. A. Chau, E. Negrou, D. J. Kelvin, J. Madrenas. 1999. Cytoskeletal disruption induces T cell apoptosis by a caspase-3 mediated mechanism. Life Sci. 65: 2697-2707. Morton, W. M., K. R. Ayscough, P. J. McLaughlin. 2000. Latrunculin alters the actin-monomer subunit interface to prevent polymerization. Nat. Cell Biol. 2: 376-378. Kim, H. S., M. S. Lee. 2005. Essential role of STAT1 in caspase-independent cell death of activated macrophages through the p38 mitogen-activated protein kinase/STAT1/reactive oxygen species pathway. Mol. Cell. Biol. 25: 6821-6833. Yu, L., A. Alva, H. Su, P. Dutt, E. Freundt, S. Welsh, E. H. Baehrecke, M. J. Lenardo. 2004. Regulation of an ATG7-beclin 1 program of autophagic cell death by caspase-8. Science 304: 1500-1502. Espinosa, A., J. R. Alfano. 2004. Disabling surveillance: bacterial type III secretion system effectors that suppress innate immunity. Cell. Microbiol. 6: 1027-1040. Rüssmann, H., K. Panthel. 2004. “One size fits it all”: translocation of foreign antigens by Yersinia type III secretion system (TTSS) leads to concomitant CD4 and CD8 T-cell priming. Int. J. Med. Microbiol. 294: 313-317. Brown, D., G. L. Waneck. 1992. Glycosyl-phosphatidylinositol-anchored membrane proteins. J. Am. Soc. Nephrol. 3: 895-906. Cadwallader, K. A., H. Paterson, S. G. Macdonald, J. F. Hancock. 1994. N-terminally myristoylated Ras proteins require palmitoylation or a polybasic domain for plasma membrane localization. Mol. Cell. Biol. 14: 4722-4730. Vancura, A., A. Sessler, B. Leichus, J. Kuret. 1994. A prenylation motif is required for plasma membrane localization and biochemical function of casein kinase I in budding yeast. J. Biol. Chem. 269: 19271-19278. Yasuda, K., A. Kosugi, F. Hayashi, S. Saitoh, M. Nagafuku, Y. Mori, M. Ogata, T. Hamaoka. 2000. Serine 6 of Lck tyrosine kinase: a critical site for Lck myristoylation, membrane localization, and function in T lymphocytes. J. Immunol. 165: 3226-3231. Black, D. S., L. G. Montagna, S. Zitsmann, J. B. Bliska. 1998. Identification of an amino-terminal substrate-binding domain in the Yersinia tyrosine phosphatase that is required for efficient recognition of focal adhesion targets. Mol. Microbiol. 29: 1263-1274. Sory, M. P., A. Boland, I. Lambermont, G. R. Cornelis. 1995. Identification of the YopE and YopH domains required for secretion and internalization into the cytosol of macrophages, using the cyaA gene fusion approach. Proc. Natl. Acad. Sci. USA 92: 11998-12002. Jacotot, E., L. Ravagnan, M. Loeffler, K. F. Ferri, H. L. Vieira, N. Zamzami, P. Costantini, S. Druillennec, J. Hoebeke, J. P. Briand, et al 2000. The HIV-1 viral protein R induces apoptosis via a direct effect on the mitochondrial permeability transition pore. J. Exp. Med. 191: 33-46. Monack, D. M., J. Mecsas, D. Bouley, S. Falkow. 1998. Yersinia-induced apoptosis in vivo aids in the establishment of a systemic infection of mice. J. Exp. Med. 188: 2127-2137. Galyov, E. E., S. Håkansson, H. Wolf-Watz. 1994. Characterization of the operon encoding the YpkA Ser/Thr protein kinase and the YopJ protein of Yersinia pseudotuberculosis. J. Bacteriol. 176: 4543-4548. Zhang, Y., A. T. Ting, K. B. Marcu, J. B. Bliska. 2005. Inhibition of MAPK and NF-κB pathways is necessary for rapid apoptosis in macrophages infected with Yersinia. J. Immunol. 174: 7939-7949. Haase, R., C. J. Kirschning, A. Sing, P. Schröttner, K. Fukase, S. Kusumoto, H. Wagner, J. Heesemann, K. Ruckdeschel. 2003. A dominant role of Toll-like receptor 4 in the signaling of apoptosis in bacteria-faced macrophages. J. Immunol. 171: 4294-4303. Lemaitre, N., F. Sebbane, D. Long, B. J. Hinnebusch. 2006. Yersinia pestis YopJ suppresses tumor necrosis factor α induction and contributes to apoptosis of immune cells in the lymph node but is not required for virulence in a rat model of bubonic plague. Infect. Immun. 74: 5126-5131. Bruckner, S., S. Rhamouni, L. Tautz, J. B. Denault, A. Alonso, B. Becattini, G. S. Salvesen, T. Mustelin. 2005. Yersinia phosphatase induces mitochondrially dependent apoptosis of T cells. J. Biol. Chem. 280: 10388-10394.